Hi, I'm Joe Statkus, and I've been researching and documenting vintage toy rings since 1989, with a special emphasis on flicker rings. A flicker ring has a clear, ribbed lenticular plastic lens over a specially created image underneath. When viewed at different angles, it will optically change between two or more separate images. Since 1989, I've had thousands of flicker rings come through my hands, and have been privy to many untouched toy ring finds, in those many years. I was one of the special advisors to the Overstreet Toy Ring Guides. And you might have seen one of my advertisements in any of the Hake's, Overstreet and Toy Ring Journal Guides. Here's one of my many ads, from the 1997 Overstreet Toy Ring Guide, picturing some of the toy rings on header cards that I acquired in my vending distributor find in 1989. Having already finished my Pictorial Encyclopedia Of 1960's Gumball Machine Toys several years ago, I had started work on a new Toy Ring Guide. The purpose being, to provide updated information regarding the actual availability and authentication of vintage toy rings since the last toy ring guide was published in 1997. Over the years, many toy rings have appeared for sale that are not authentic. My toy ring guide will have an extensive chapter written about these unauthentic rings. But for now, this brief article will help to educate the toy ring collector about flicker rings. 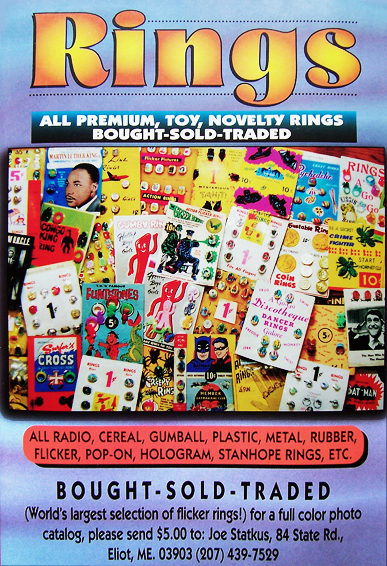 And if you've decided to join the toy ring hobby, I would suggest getting a copy of the Overstreet Toy Ring Guide. It contains roughly 95% of all the toy rings that were legitimately produced. The reason that I say 95% is because there have been more toy ring discoveries since the last guide was released. It will help you to be cautious before purchasing a ring that is not shown in the guide, unless it has worthy documentation by the seller. 1950's/60's flicker rings have been legitimately produced by many other companies besides the Vari Vue Company, such as Cine-Vue, Japanese, Hong Kong and others. But since there have been so many flicker rings being erroneous advertised for sale as a true and complete Vari Vue product, I will address that issue mainly in this article. In 1986, the major manufacturer of lenticular products, Vari Vue in NY, held a liquidation auction before going out of business. At this auction, thousands of loose ring flickers and uncut sheets of lenticular ring lenses were sold, but not the authentic bases that the flickers would be glued to. Attendees at the auction had told me that there was a very large amount of bagged blue ring bases, that resembled a small picture frame. These have been dubbed "big blue bases" by toy ring collectors, not to be confused with legitimate smaller blue bases. Here is a picture of those big blue bases below, along with some loose ring flickers. One woman bought most all of these big blue bases. And after the auction, she had sold quantities of the bases to the people that had bought the loose ring flickers. These people attached their flickers to these bases and sold them throughout the years to collectors. The problem was that these ring bases had never been used by Vari Vue to make flicker rings. With one exception though. One of the attendees that I have done business with, told me that he saw a bag of the Sunbeam Bread girl flicker rings auctioned off, that had been attached to the big blue bases inside the factory. However, there is no documentation that they had ever left the factory to be distributed anywhere. And so, any flicker rings that are being offered for sale on these unauthentic bases are definitely not legitimate Vari Vue products. The woman continued selling these big blue bases until the supply eventually ran out. That still left a large quantity of these loose flickers in dealer's hands, with no bases to glue them to. Coincidentally at this time in the 1980's, large quantities of flicker ring knockoffs had started to flood the market from China. Not only had they copied many of Vari Vue's images, but they also copied a V-base style base previously manufactured in Hong Kong, that had been widely used by Vari Vue. Gross bags (144 rings per bag) of these knockoff flicker rings were selling for between $10-$20 at first, and then $30-$40 when the supply started to run out. This was before the internet. And they were mainly sold through the old Toy Shop toy collectors newspaper. The difference between the Chinese flickers and Vari Vue flickers is easily distinguishable, since the Chinese flicker is twice the thickness of a Vari Vue flicker. 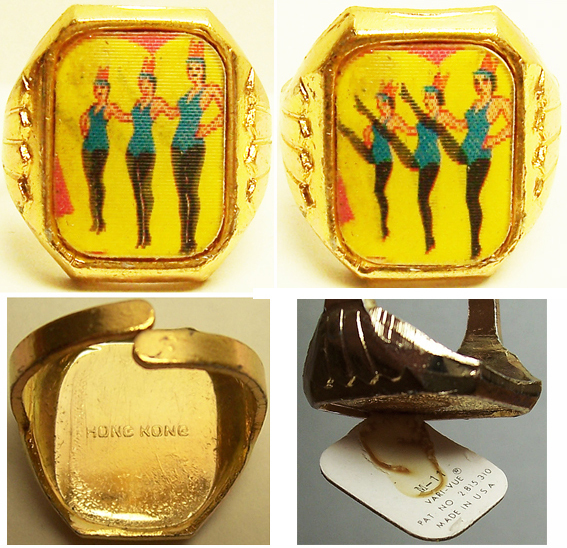 These 1980's knockoff rings are sometimes mistakenly advertised for sale as 1960's. There are a few other Chinese knockoff Vari Vue rings besides what is shown below, such as Animals w/name superimposed over image, Rabbit eating carrot, etc. the word China was molded into the back of the base where the two prongs meet. Although it is fairly easy to decipher the word China on the prongs, alot of examples do not read so easily(or not at all) because it was poorly molded into the prongs. It is always easy to read Hong Kong on the legitimate 1960's bases. Below are the two flicker rings shown side by side for comparison. Always check the backs of these V-bases before purchasing a ring that is being advertised as a Vari Vue product. Because if it says China, or nothing at all, then it is a 1980's knockoff. Now, I must mention that besides the China knockoff flicker rings, Hong Kong had also dabbled in their own unauthorized use of Vari Vue images to manufacture copies in the 1960's. 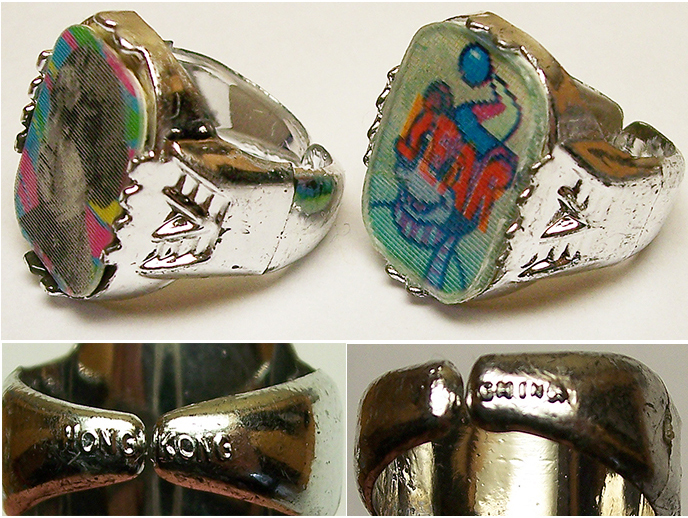 Some of the Hong Kong copies that I've found thus far are the four different Popeye flicker rings from the set, six different Tarzan flicker rings from the set, and the Batman flicker ring pictured below, which is not so easily acquired as the Popeyes and Tarzans. Hong Kong copies are easy to distinguish from the legitimate Vari Vue issued rings, by the somewhat faded color and much thicker flicker lens. Pictured below are the Popeye and Tarzan Hong Kong copies. Before I move on, I should mention that Vari Vue did authorize other countries to manufacture their images. For instance, the Batman flickers pictured below were manufactured in 1971. They were manufactured in Mexico. They were premiums that were given away free, two for each package of a snack cake product purchased, and were to be collected and inserted into an album that was provided by the promoting company. The album had numbered squares on the pages, that you were to try to fill with the corresponding numbered flicker squares. Almost all the Vari Vue popular character flicker ring images were leased for this promotion, such as Looney Tunes, Green Hornet, James Bond, etc. And they were all manufactured as square flickers. So if you should ever happen across a flicker ring with one of the 1966-68 Vari Vue flicker ring images that is square cut (with the exception of baseball players with the team's name, Huck Finn, Buster Brown and The Three Stooges), then somebody created the bogus ring. It is not an authentic Vari Vue product. Pictured below are some of the bogus flicker rings that were made from these Mexican flickers. They are worthless to a toy ring collector. Don't throw your hard earned money away chasing after fantasy rings. Moving on, the most egregious practice that still continues today, is the hand cutting of uncut sheets of Vari Vue flicker ring lenses, that were acquired at the auction. 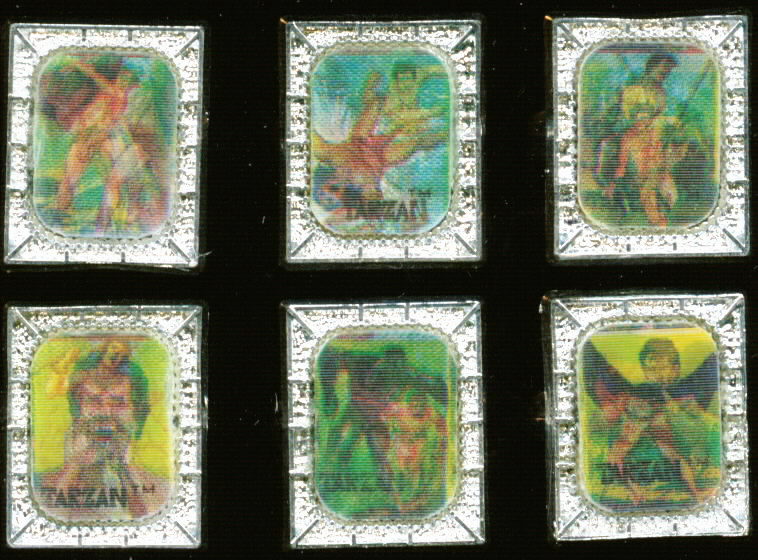 Luckily to my knowledge, I know of only (13) different uncut sheets of ring sets that were acquired at the auction. The following is a list of those: Green Hornet, Wizard Of Oz, James Bond, Beatles, Tarzan (not the set of 6), Three Stooges, Li'l Abner, Sunbeam Bread Girl, Buster Brown (square version), Captain Action, McDonalds, and a very small amount of Batman and Marvel. 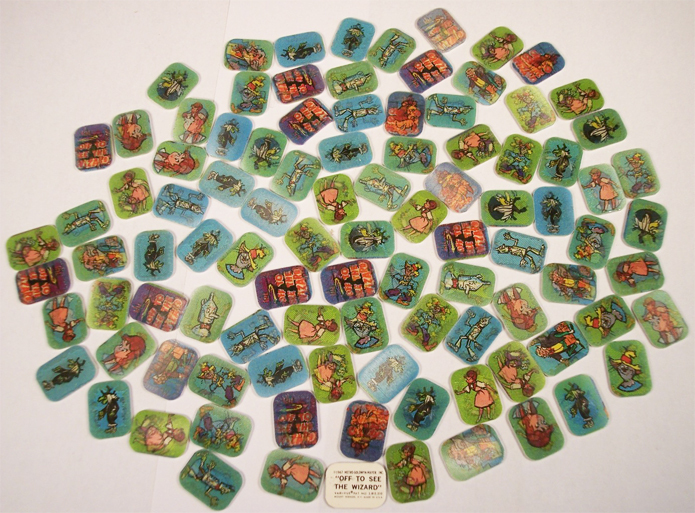 Pictured below is an entire sheet of Captain Action flicker ring images. It is virtually impossible to cut all four corners curved, all exactly the same. And so some of the hand cut flickers are easily noticeable, like the examples pictured below. But some dealers, in their quest to sell flicker rings that are made up from hand cut flickers, will try to cut the corners as perfectly symmetrical as possible. Below are a couple more examples. There are rounded corner scissors and round corner lever punches that are made for trimming photographs and scrapbooking. They are made to cut through paper and cardboard, and so I don't know how well they would work cutting through lenticular plastic. But just to be safe, it is wise to check the corners very closely. You will not have any trouble recognizing a legitimate Vari Vue factory machine cut flicker ring lens. The four corners will be all be exactly the same. Another deceitful practice is the creation of flicker rings that were never manufactured. Just about any flicker image can be made to fit onto a ring base. Here's just two examples below. This is a legitimately manufactured bracelet utilizing Vari Vue 10 Commandments flicker images. The flicker images are just the right size to pick off and made into flicker rings. Of course these flicker rings were never produced by Vari Vue. Here's another example below. That's just two examples of the lengths that some people will go, to create bogus flicker rings. Collectors tend to forget that flicker rings were manufactured for kids, not adults. I used to wonder how some rings could have the flickers glued onto the base so much off center and not straight. I found my answer after talking to a fellow that had lived in the neighborhood of the Vari Vue factory in NY in the 1960's. He told me that his family used to pick up bags of loose flickers and bases from the factory. And the whole family would sit around the kitchen table at night, gluing the flickers onto the bases. They got paid for doing piece work for extra income. He told me that lots of families in the neighborhood made extra income that way. I'm guessing that those misaligned flickers were probably glued on by some young child... or inebriated adult, lol. Some collectors also mistakenly believe that Vari Vue only used certain bases for certain rings. Vari Vue acquired dozens of different bases at different times in the many decades that they were in business. So the same flicker insert could have been attached to more than one style base. When they first started producing flicker rings, the flickers were cut rectangular. And then later on, they changed their cutting dies to rounded corners. When Vari Vue changed over from the rectangular cut to the rounded corner cut flickers, they didn't just throw the older bases away and acquire newer ones. They glued the new rounded corner flickers to the old bases, until they ran out of those bases. The photo below is a full box of Marvel flicker rings that I had acquired several years ago, showing the newer rounded cut flickers glued to the older bases. Below are pictures of some of Vari Vue's most widely used flicker ring bases over the years. It is a seldom spoken fact that over the years, collectors have also been reattaching legitimate Vari Vue flickers to authentic bases that were used by Vari Vue. Detaching the flickers from unauthentic bases or broken, beat up bases. Is that wrong? Not when compared to the accepted practice in the antique world of replacing unoriginal parts with original ones, be it vintage cars or important antique furniture. This practice has been going on in the flicker ring hobby for decades, and will continue to do so. So if you were one of the many collectors that had unwittingly bought flicker rings that are attached to the big blue bases, or 1980's China V-bases, you did not throw all your money away. They still have value because the flicker is the important part of the ring. But if you are a collector that only wants true examples, you can bring them back to authentic condition by swapping them to legitimate flicker ring bases, and increase their value. the Vari Vue factory in the 1960's and actually saw their ring assembled, or discovered the ring in an untouched vending distributor find. There were 1000's of loose flickers bought at the Vari Vue liquidation auction. Pictured below is just a fraction of what was sold at the auction. How could anybody possibly know if their flicker was glued onto a base in the 1960's, or just recently? The answer is that they can't. And that is why essentially, what really matters is if a flicker ring is made up of an authentic flicker, attached to an authentic base. any of their flickers to metal bases in the U.S. Although, companies outside of the U.S. did acquire Vari Vue manufactured flickers, and attach them to Hong Kong gold metal adjustable bases, as shown below. But outside of the U.S., only Vari Vue generic images were attached to these bases, and NOT any of the licensed (popular character) images such as Munsters, Green Hornet, Wizard Of Oz, James Bond, Beatles, Tarzan, Three Stooges, Li'l Abner, Sunbeam Bread Girl, Buster Brown, Captain Action, McDonalds, Marvel, Baseball Players w/team names, Soupy Sales, Looney Tunes, Universal Monsters, Casper, Tom and Jerry, Laugh In, Martin Luther King, JFK, Dr. DoLittle and Huck Finn. Also, some Vari Vue generic images were NOT attached to this base, such as from the Dance set w/names such as (Twist, Freddie, Swim, Frug, Swim, Jerk), Space scenes, Football. So, any of the flickers that I mentioned above, that you might come across, attached to the gold metal adjustable Hong Kong base shown above was not assembled by any company. And would have been done by a collector or dealer. most recent large find of vending machine toys and rings in NC in 2014. In that untouched find, several flicker rings had been discovered on authentic bases that they had not been seen on before. And so to say that a particular flicker had only been originally assembled onto a certain authentic base is not true. But with that being said, when it comes to the more scarcer and rarer rings, some authentic bases are more desirable to collectors. Like for example, as I show below. Pictured below are flicker rings that toy ring collectors refer to as Clip Rings. These early flickers are definitely Vari Vue, because some are marked as such on the backs. The metal bases are size adjustable in the back. They most likely were made back in the 1960's, judging by the early flickers and bases. Vari Vue would not have made flicker rings with hand cut flickers. All their flickers were professional cut on a machine. Somebody obviously had acquired a quantity of these flickers and ring bases. And then clipped the four corners of the flickers with scissors (as evidenced by the uneven cuts) to fit into the top, before bending the four clamps over to hold the flicker in place. Although they are not a complete Vari Vue product, they are still desirable to collectors because of the scarcity of these early Vari Vue flickers. To show you a few examples of flicker rings that had been originally assembled onto several different style bases, the pictures below are Man From Uncle and Green Hornet flicker rings that were discovered personally by me in my untouched vending distributor find in 1989. The same find that I produced my Pictorial Encyclopedia of 1960's Gumball Machine Toys CD from. making a fake ring back in the 60's, when it would have been easier to just buy one out of the gumball machine, for only a dime.